Chef Sven Mede was born to cook-literally. After all, food is the Mede family business. It's no surprise, then, that young Sven was born with a taste for culinary success. TravelsinTaste.com had the opportunity recently to interview Chef Mede, who has served as the Executive Chef at Nobhill at the MGM Grand in Las Vegas since December 2004, about that success, as well as the heritage and the training that groomed him for it. Chef Mede's career has followed a distinguished path. Before arriving in the United States, he apprenticed under French chef Raymond Blanc at his Michelin two-star restaurant "Le Manoir aux Quat' Seasons" outside of Oxford, England. Subsequently, he was part of the opening team at Bradley Ogden in Las Vegas, where he was instrumental in winning the restaurant's "Best New Restaurant" award from the James Beard Foundation. 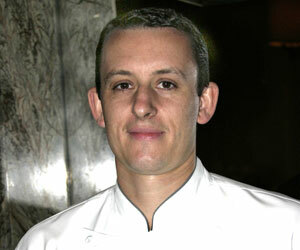 Prior to that, Chef Mede exhibited his talents at Charlie Trotter's in Chicago, where he prided himself on presenting a unique version of modern American cuisine. When asked about his mentors, Chef Mede simply couldn't come up with one. Instead, he claims multiple chefs as his mentors, all of which have a distinguished past: Raymond Blanc (of Le Manoir aux Quat' Seasons in Oxford, England), Charlie Trotter (of Charlie Trotter's in Chicago), Bradley Ogden (of Bradley Ogden in Las Vegas), and Michael Mina (of Nobhill in Las Vegas). Mede says he has learned a great deal from every one of his mentors, and he credits each of them with teaching him a variety of techniques that have helped him climb from rung to rung up the culinary ladder.